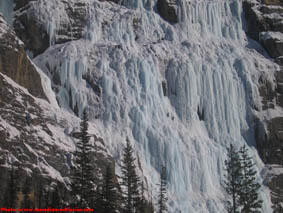 The Lower Weeping Wall from the road. Notice the two climbers in the center of the wall. Walk 5 minutes to the base. Route Description: One of the most famous ice climbs in the world, the Weeping Wall offers a number of great lines ranging from WI4 to WI5+. The most common lines are the Left Hand (WI4), the Central Pillar (WI5+), and the Right Hand (WI5), although numerous variations are possible. Another line known as Snivelling Gully is hidden on the left and goes at WI3, although it is often wet and/or snowy. 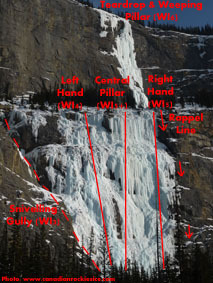 A direct finish to Snivelling Gully goes at WI5, and is obvious when formed. The Upper Weeping Wall is just uphill and makes for a much longer and more difficult day of climbing. 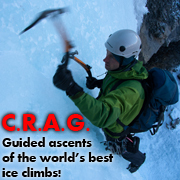 Descent: It is possible to rappel anywhere on V-threads, but a fixed rappel line exists on the far right. For this fixed rappel line, start with a rap off a tree with a large chain around it and rap straight down then move right to bolts on a rock ledge at 55m. Make a second 55m rappel straight down to more bolts, then a third rap to the ground. Gear: Screws. 2 ropes for descent. Objective Hazards: Because the wall gets lots of sun, beware of hanging pillars and curtains above. There is rarely avalanche hazard.